One of the lovely homes in the area. No, this is not our home. We have somewhat more modest quarters. There are many things I like about the older part of Tulsa where we live. One is that is home to many little ponds and streams that wind through the old neighborhoods. 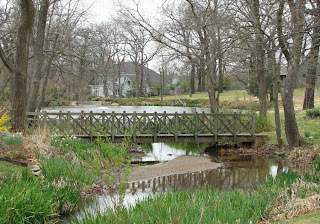 Here is a little creek that runs in the general area of the Tulsa Tennis Club. On both sides of the creek are the back yards of two streets of houses. If I were a child living in this neighborhood I would be looking for crayfish in here. This is the view along the road side. Because of the snow fall the pink blooms looked even brighter due to the contrast. By today the snow was all gone. 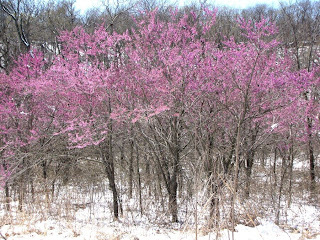 There is an area in Northeast Tulsa that is known as Redbud Valley because of the number of Redbud trees that grow wild there. 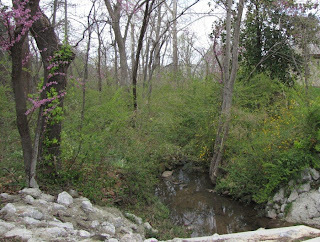 At the far north end of 161st East Avenue is the Tulsa Redbud Nature Park where scenic hiking trails lead the walker through a little touch of wilderness. Our friend Renny would enjoy this. 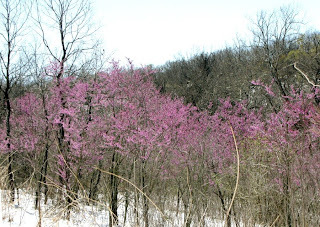 These are wild native Redbud trees. They self-seed and are found along road sides and dotting the hill sides all overEeastern Oklahoma and the surrounding states. Because they are beautiful and very hardy, they are also planted around many homes and businesses. This time of year they put on a lovely show. Here is a little panorama of my back yard, two photos stitched together courtesy of ZoomBrowser. Again, this was earlier this morning. By 3:00 PM the snow is almost all gone. Sue and I took a little drive after church and took some pictures of Redbud Valley. I will share those tomorrow. The snow stopped during the night and this morning the sun came out. I took a few pictures before we went to church, and by the time we returned it was mostly melted and now the temperature is around 60*F (16*C). As you can see my Lilac bush is bowed but unbroken. I will tie it back and it will be fine. 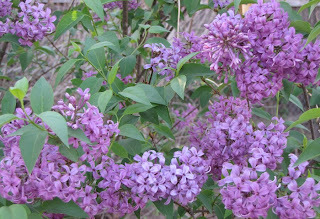 My lilacs were blooming and spreading their sweet fragrance a few days ago. They were pounded by a late spring snow yesterday but may have survived as it did not freeze very hard. In the mean time, here is a jigsaw puzzle for you to enjoy with your coffee. My Late Great Lilacs. Rest in peace. Smokey finally got desparate enough to go out in the snow and do his business. 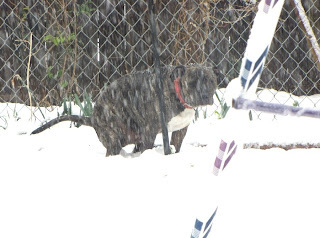 Poor guy, he had to go out and poop in the snow. I can't accuse him of being a pussycat now. 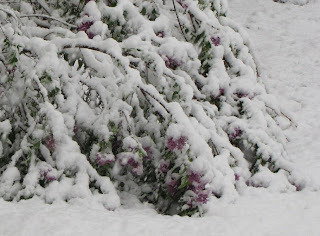 Here are my poor lilacs. They were in full bloom. I took a nice picture of them on Thursday and planned to use it Friday but featured the rain instead. It may make a nice jigsaw for Sunday. 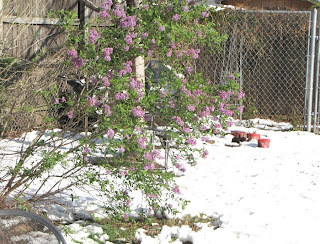 If the temperature does not go much below freezing the lilacs may survive. The snow is even sticking on the streets. We are forecast to have 4 inches (10 cm) but it is that deep already and the snow is to continue all day. Last week we had a high temperature of 82*F (28*C). Oklahoma weather is variable if nothing else. If you look at a geological map of the United States you will see that Oklahoma lies just below the center. To the west and east are mountains. to the north are the great plains and Canada. To the south is Texas and the Gulf of Mexico. Cold dry air comes down from the north and warm moist air comes up from the south and the elements fight it out over Oklahoma. As these weather systems swing one way and then the other, the weather in Oklahoma can chage very dramatically. I suppose it would be boring to live where the weather is predictable. 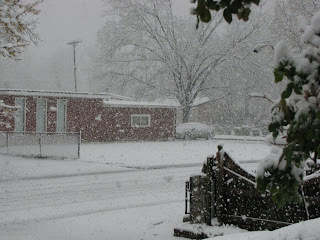 Last night the forecast was for the rain to turn to snow. I didn't take that seriously because the temperature was not supposed to drop below freezing. My mistake. 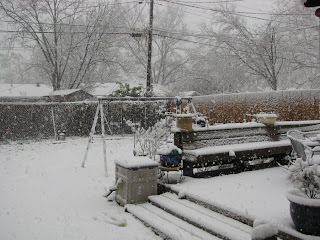 The temperature is 37*F (3*C) but the snow is coming down so hard that it is accumulating anyway. The problem is with Smokey. 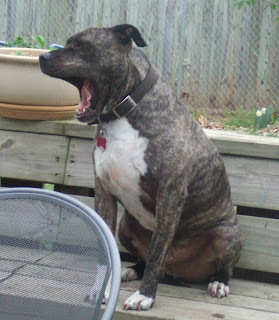 You would think that a dog whose breed has a reputation for ferocity would not mind a little thunder and rain. He does not like rain, and thunder makes him shiver. I finally threw him outside to do his business and he squeezed out a quick whiz then hurried back to the door to be let in. I told him he was a pussycat. He didn't care. 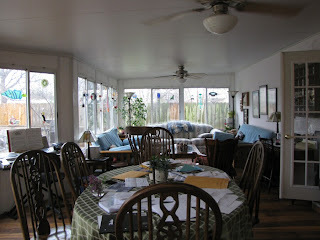 Since you have seen most of our Garden Room I might as well let you see the other end. Our house is small and we had this built across the back when we got married. Susan and I find this to be such a pleasant room we mostly live back here. Sorry for the mess; we've been computing our taxes. We did not have much rain last winter, so we need the moisture. My little rain gauge says we have had about 2 inches (5 cm) in the past 2 days. That will help. It rained most of the night and again today. Sue had to go see about her mother but Smokey and I stayed home and watched the rain outside. 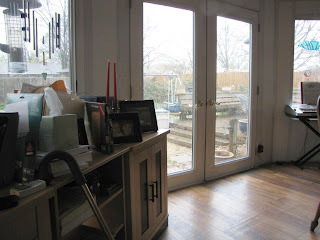 This is our Garden Room which looks out on the back yard. This corner serves as my computer area. Yes, I know my desk is messy. Susan has reminded me of that many times. But I know where everything is. It is like an archeological dig where things are buried in layers. 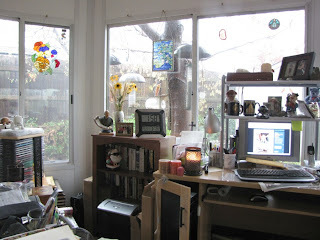 I went to the dentist yesterday (ugh) and on the way there a rain storm moved in and it began to rain hard. 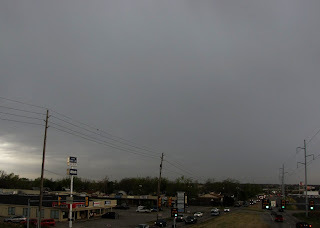 I pulled over on an overpass and took a picture of the rain moving across the city like a grey curtain. This was at about 1:00 PM and it grew so dark that cars turned on their headlights. I had broiled flounder and David had halibut. He is giving his lunch his full attention. Happy Birthday David. I am very proud of you. In reading back over this I am reminded of something I wanted to add. 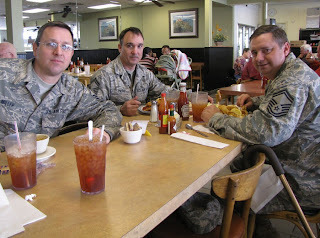 While we were eating a man stopped at our table to tell David and his friends that he appreciated their service, and they thanked the man very politely. I asked David if that happened often and he said yes, it did. They go off-base to eat lunch most days. Sometimes when they finish and go to the counter to pay, they are told that someone has already paid for their lunch and left the simple message, thank you. Our military men and women have had to make many sacrifices over the past 8 years and many people appreciate their service. 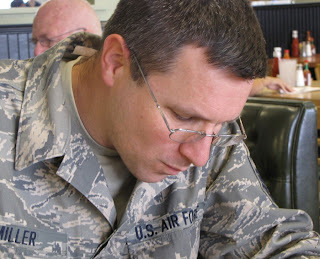 David is a First Sergeant in the Oklahoma Air Guard and works full time at the Tulsa Base. Joe and Andy work with him and came separately but we sat together. There are a lot of stripes at the table. 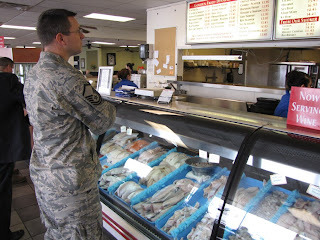 Just inside the door is a 12 foot display case which allows visitors to see the quality of the seafood and to select the exact pieces to be prepared for the order. David is trying to make up his mind. My son David has turned 40. Our tradition for some time is that we meet for lunch and I pick up the tab. 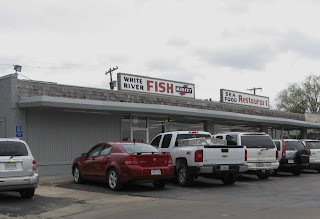 One of our favorite places for this is the White River Fish Market on Sheridan just north of Pine in Tulsa. In coastal cities markets usually sell the fish harvested in their regions, White River's market sells a wider variety of seafood. 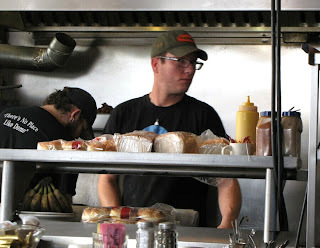 Being centrally located in the United States allows White River to fly in seafood direct from the suppliers from all coastal areas of North and South America. It is a little short on fancy decor, but it's selection and quality is second to none. It has been featured as a treasure on National Public Radio's "Splendid Table". Greg told me last week that when he was in Gambia he had enjoyed fried talapia. I told him that La Hacienda did a good job of it so we met here for lunch. Sure enough, it met his expectations. It is scored on the sides then fried in very hot oil. 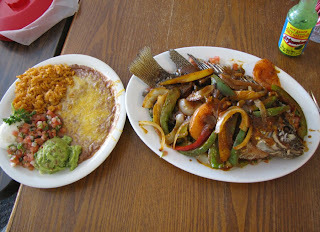 It is served with peppers and onions and ranchero sauce over it and is really tasty. The fish we got today were unusually large. It is more than a person can eat -- but we did our best. I wonder if Zhu had talapia in South America. 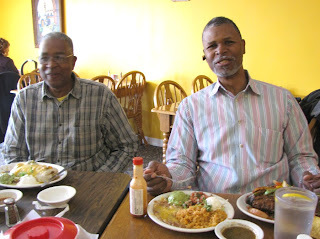 Today I met my dear friend Leron and his son Greg for lunch at La Hacienda on Peoria. Both are pastors and good Christian men. Greg just returned from a 3 week mission trip in Gambia and we wanted to hear about it. Stop thief! 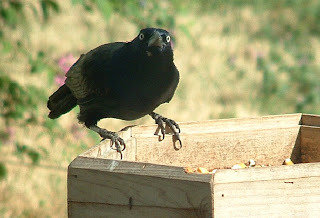 Does this bird look guilty to you? 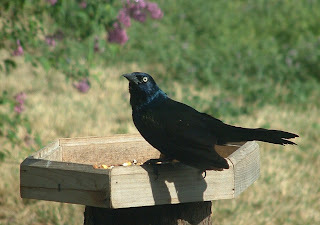 When I fill up my bird feeders great flock of blackbirds come swarming in to gobble everything up. They are very intelligent and watch for me through the window. If I raise my arms they fly away, but then come right back again. We pause our recent series of photos of spring flowers to bring you a special announcement. Those of you who were readers of this blog back in October will recall a great deal of excitement about the birth of our newest grandchild Grant. His father (Susan's son Paul) had been relocated to Seoul, South Korea leaving wife Beth and 3 year old daughter Amber behind in Maryland. Saint Susan made several trips to the east coast to assist with the new baby, than another trip to Seoul to facilitate the travel. Since then things have calmed down a bit, but Mr. Grant is still going strong. 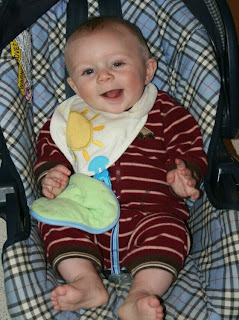 We share a recent photo revealing him to be at the age of 5 months and double his birth weight . All is well and he is even sleeping through the night. 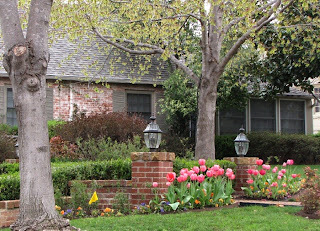 Bright tulips frame the front walk of this lovely home. It is a beautiful time of year. Click on the image above for the Jigsaw Puzzle. Enjoy! I hope that you don't get tired of my pictures of spring flowers, but they are so spectacular this time of year that I can't resist. I believe this to be a flowering plum because the individual flowers arrange themselves in rounded clusters along the branches. Trees like this are developed for bloom not for fruit. 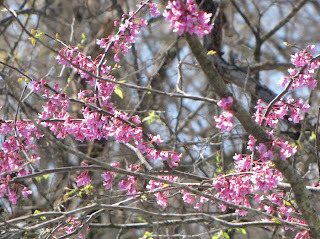 Like the Bradford pear, the ornamental plums are sterile or produce insignificant fruit. The warmer weather is bring more and more blooms out of their winter storage. 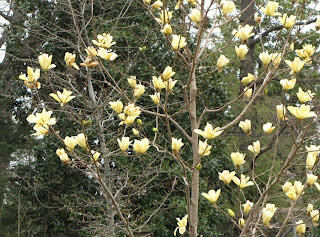 This is a lovely little Tulip tree. It is a type of magnolia I think but am no expert. I just know it is very pretty. Smokey and I drove around looking for something nice to photograph. This is a pretty scene, worthy of a Monet. Actually this is at the other end of the little lake I photographed last week. 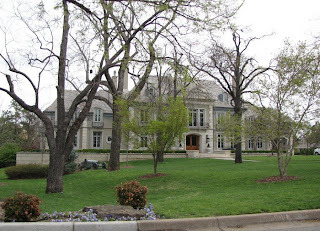 This is a beautiful neighborhood, nice houses, old trees, quiet and peaceful. Almost as nice as Micki's. 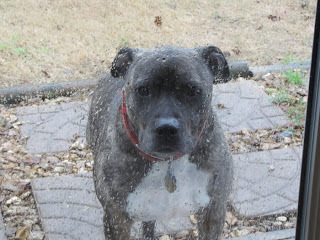 My friend Smokey is very faithful to ask to go outside to take care of his business. But if the weather is cold or wet, he wants right back inside. But the last several days it has been very nice outside and both Smokey and I have enjoyed sitting on the deck in the back yard. This afternoon the high temperature was 82*F (28*C) and it is very nice to take in some fresh air. 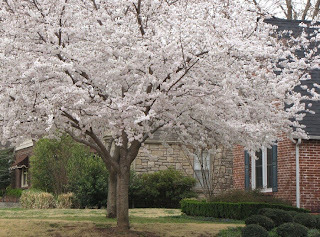 Tulsa's trees are very beautiful at this time of year. This is Pink Magnolia. 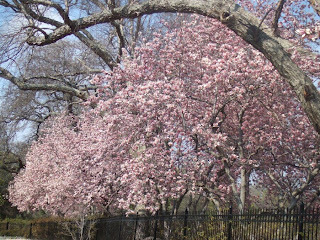 When these are in bloom, nothing is more beautiful. 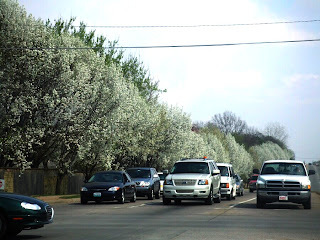 Tulsa's streets are lined with Bradford Pears in full bloom. Spring is surely here. Gavin had a great birthday. Mike is like a son to me and we claim Gavin as a grandson. He is a very sweet kid. 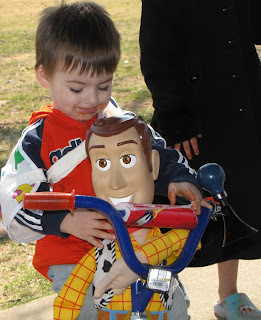 Gavin and Cowboy Woody just fit on Gavin's new bicycle. Gavin was in heaven. The last present to be opened was from Gavin's mom and dad. 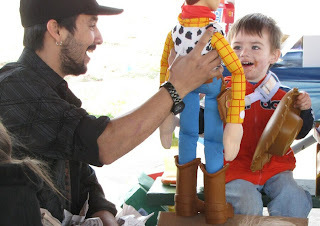 A Gavin sized Cowboy Woody!! Did Gavin like it? Oh My, did he ever! Then it was time for presents. There were plenty of helpers. 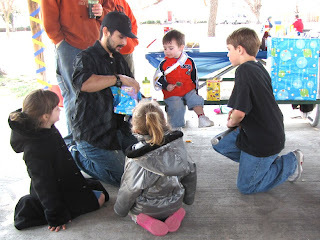 ...and everybody scrambled for the candy that poured out of the pinata. 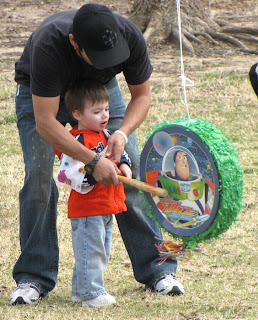 Mike found a Toy Story pinata and tied it to a tree. Gavin got the first swing -- and the second, and the third. All the little kids gave it a whack but it was too tough for them. Amber organized everything and spent most of the time taking pictures. 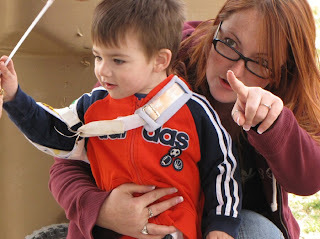 Gavin fell out of his highchair last week and the doctor gave him a sling to wear, but Gavin is too busy to notice. 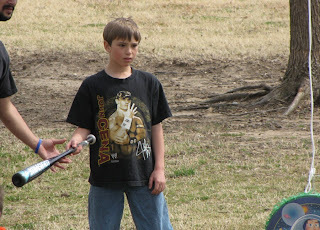 He is tough like his father. 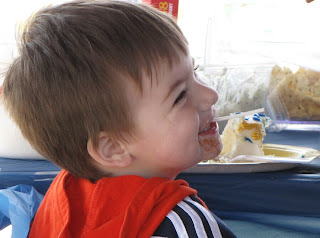 Mike and Amber's boy Gavin celebrated his 2nd birthday today at one of the Tulsa Parks. 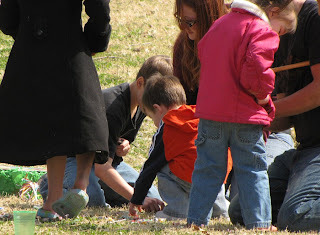 All the grandparents were there and a lot of his young cousins. The weather was a little cooler than we had hoped but it was a fine party anyway. 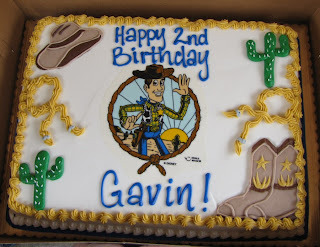 Gavin REALLY likes Cowboy Woody from Toy Story so the cake pictured an edible version of Gavin's hero. Today is Sunday and I promised a puzzle. Yesterday we watched a baseball game on TV between The Chicago Cubs and the Los Angeles Angels. It was just spring training but it reminds us that baseball season is very near, and I do love baseball. Here is a nice picture I took at the Chicago Cubs home at Wrigley field several years ago. It makes a nice puzzle. Click on the picture to display the jigsaw puzzle. Be patient as it loads rather slowly. 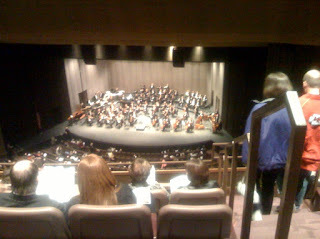 We have season tickets for the Tulsa Symphony in the very top row of the balcony - the nose bleed seats. I like them. We can see everything and the acoustics are excellent. For $30 each it is a great bargain. 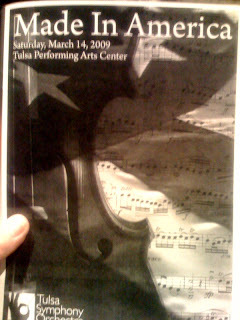 Tonight's program is "Made in America". Guest conductor Edwin Outwater with selections by John Williams, Randy Newman, Samuel Barber, Charles Ives, John Adams, George Gershwin, Leonard Bernstein, and William Schuman. Photographs tonight from my sneaky little iPhone. 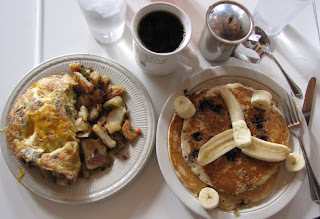 Susan and I treated ourselves to breakfast at the Blue Dome Diner downtown at 2nd and Elgin. This part of Tulsa is on the old Route 66 and was the heart of Tulsa in the 1920's when Tulsa was enjoying the oil boom. The downtown area fell into disuse as is true for a lot of cities, but is now being revitalized as an entertainment district. 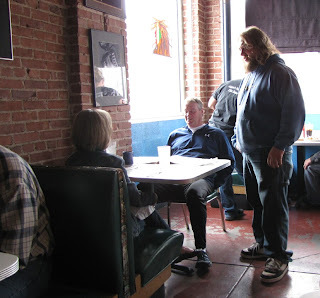 This is only one of a number of good restaurants, bars, and music venues that are filling up the old storefronts again. It is a "happening place". 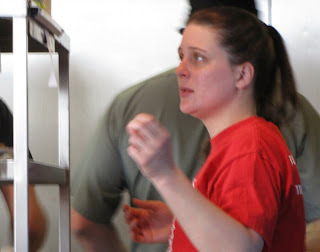 Cara is the business manager, waitress, assistant cook and all around sweetheart. She makes sure my coffee cup never runs low. My son Luke is the chef, although that may be too fancy a term in a diner. We will say he is the head cook. He is a marvel to watch him moving non-stop, arms flying, flipping pancakes and mixing omelets. He is a pro. 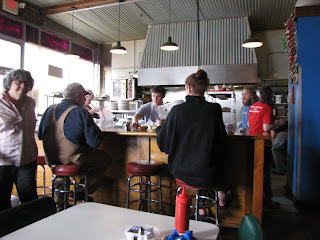 Here is the best breakfast in town. An omelet with pork sausage and mushrooms, fried potatoes , and a small(?) side of walnut-blueberry pancakes. Luke decorated them with half a banana. Served with real butter, warm maple syrup, and a bottomless cup of black coffee. Sue had a mushroom and swiss cheese omelet and a side of biscuits and cream gravy. Heaven!